Bristol 404. A long project which required the body to be removed from the chassis to repair the mounting frame. The body was repaired, refitted, then new door skins made and fitted. Here are a couple of Aston Martin projects. On the left is a DB6 dash. The customer was doing a right hand drive to left hand drive conversion and wanted a dash to suit. On the right is a DBS front panel assembly after the car had a small disagreement with a brick wall! Both are unavailable from Aston Martin and had to be made from scratch. Above is a selection of pictures of a customer’s Caterham 7. It started with a small chassis modification to give more elbow room and ended up having bespoke front and rear wings, boot cover, half tonneau cover, half doors, air intake (to reduce intake roar) and nose cone with integral oil cooler scoop. 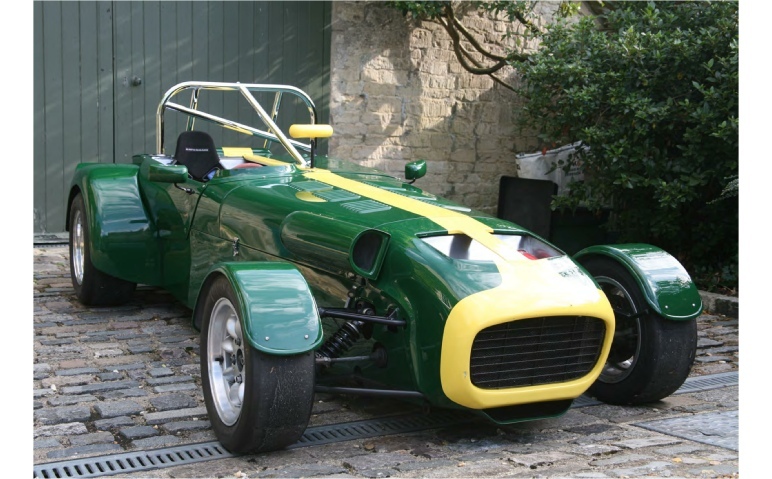 Although the nose is copied from the original it is actually a couple of inches longer than standard to allow the water radiator air to be ducted through the top and the oil cooler air to be ducted under the car. There is also a large NACA type duct in the side to duct air to the dry sump tank. This is an AC Ace. It had already had a new rear body fitted and some repairs to the front. My job was to finish it off by re fitting and gapping the boot, new door and bonnet skins and general tidy up. A selection of pictures showing the diverse projects I get involved in. CSX Shelby Cobra which arrived as a standard small box wheel arch car that the owner wanted to return to a race car. The wide wheel arches needed to be added to suit the tyres, an FIA type bonnet scoop skin was made and fitted then it was on to making the long LeMans type roof which also requires a two part boot lid to be made and fitted.